The Kindergarten students in my classroom have been working on the comprehension strategy of Visualizing in our Shared Reading of the big book, I Wish I Had a Monster, by Judy Waite. We have discussed that good readers "paint a picture in their minds" while reading or listening to a story. For this particular Shared Reading, I read the big book to the students without showing them the pictures. The students were then asked to visualize what they thought the monster looked like by listening to the repetition in the book: "I wish I had a monster," said Max, "a big, hairy scary one, with green gleaming eyes, yellow terrible teeth, wild waving legs, red splotchy spots, and sharp, pointy spikes." 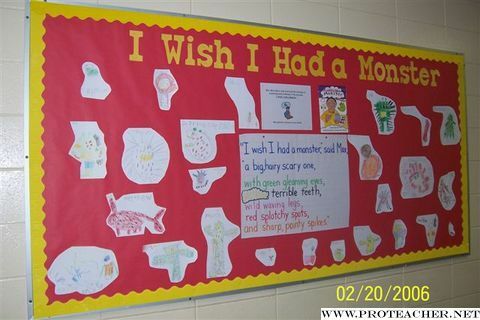 The pictures that are displayed on the bulletin board are the pictures the students drew after returning to their seats from listening to the big book.